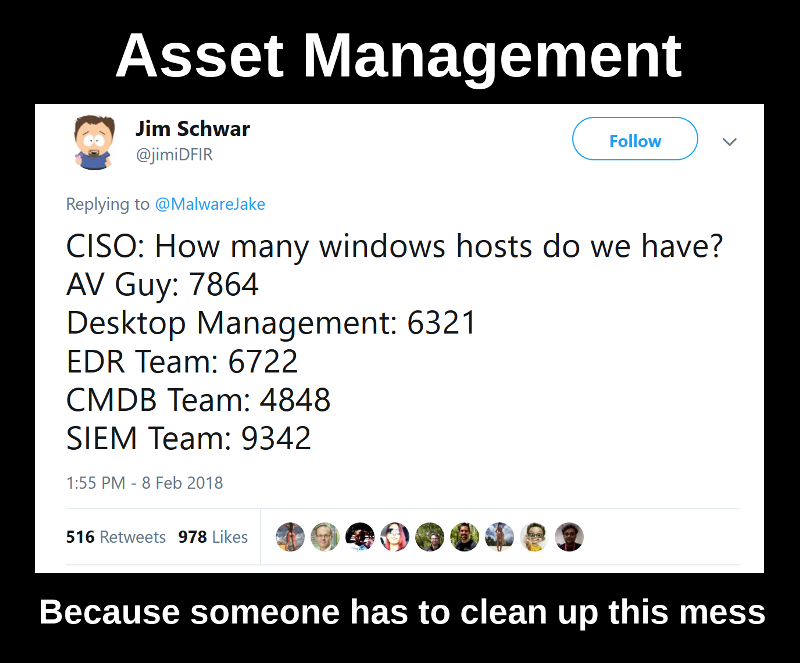 So, how many Windows hosts do we have? Intercept the host sets from the different datasources (AV Management Servers, Desktop Management system, Endpoint Detection systems, CMDB, SIEM, LDAP, IT Monitoring systems, etc; the actual set of inputs depends on what is in use in the particular organization). Stimulate the teams to add new hosts to their systems and try to automate these actions. If you have such differences, this probably means that the logs are not collected from every host, agents are not installed on every host, some domains, some offices or some datacenters were forgotten. Ideally, everything should be the same everywhere. And not only for Windows hosts. Practically speaking, in a similar situation I send all the data to Splunk using custom HTTP Event collectors for further analysis and demonstrate statistics about the hosts on dashboards. If there are any anomalies (host should exist in some data source, but in fact it doesn’t), I send the alerts to the owner of the datasource for investigation. I also use this system to manage Vulnerability Assessment process. Of course, the ideal is unattainable, but when we start to measure the current situation, the mess decreases and the real security level increases drastically. Why should we analyze various datasourses if we already have a Network Scanner? Some might say that port scanning is enough for host discovery and we don’t need to analyse various datasources, including those that are maintained by IT teams. But, IMHO, the active unauthenticated scanning is the dumbest way for Asset Discovery. It takes too much time to run on a huge networks (discovering all open TCP and most used UDP ports). It creates unnecessary load on network devices and target hosts and can break the servers (see my previous post “Can a Vulnerability Scan break servers and services?“). It’s unreliable, because you never know if the host is inactive or you have problems with network access, or the host answers you very-very slowly and has some rare service on some rare port. I also criticized it in my post “Asset Inventory for Internal Network: problems with Active Scanning and advantages of Splunk” and it’s not just me, read this page about Netbox “Why Doesn’t NetBox Scan for IPs?“. Active unauthenticated scanning is a good way to detect shadow IT infrastructure, that couldn’t be spotted other ways. It’s good to have such scans as one of the sources for Asset Management. But I don’t think that it should the main and only Asset Discovery method as most of the Vulnerability Management vendors do. Especially if you have ipv6 networks, where you technically can’t make the detection scans. What information you need about the Assets? The most important is the Owner, who should approve the implementation of the Security Measure or implement it by himself and provide additional data that we need. Who should make such Asset Management system? As I already wrote in the post with the requirements to Asset Inventory systems, the best scenario if a robust Asset Management is provided by IT department. Or at least if they have a will to make the system that knows about all the hosts in the organization. It’s much better to be just a consumer of this data and some times report system anomalies than to build Asset Management system on your own. But, as practice shows, in most cases IT security team will be the most interested in keeping asset data up to date. If IT team doesn’t want to provide such system for some reason, it will be necessary to collect and analyze all the information by Vulnerability Management team. ← Can a Vulnerability Scan break servers and services? Great post Alexander, I’ve been doing a little research on this topic myself recently for a client I work with and your view on differnt ways to collect the data has helped stir some additional thought. I certainly agree that the asset/application owner is key for change, problem and any incident management.